Happy Sunday! 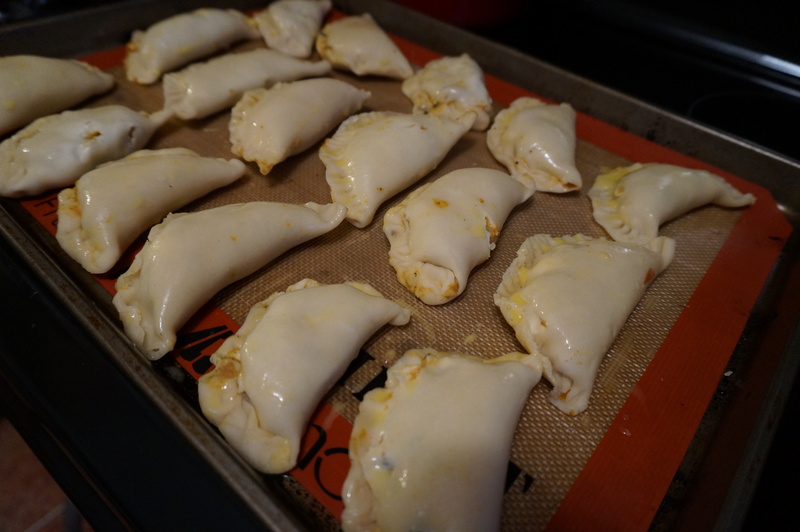 As you may have already seen on Instagram, I made these sweet potato empanadas last night to bring over to a friend’s house for their annual Friendsgiving (which, by the way, is an awesome tradition… two Thanksgiving feasts in one week? Umm, yes please.) and I think they were a hit! 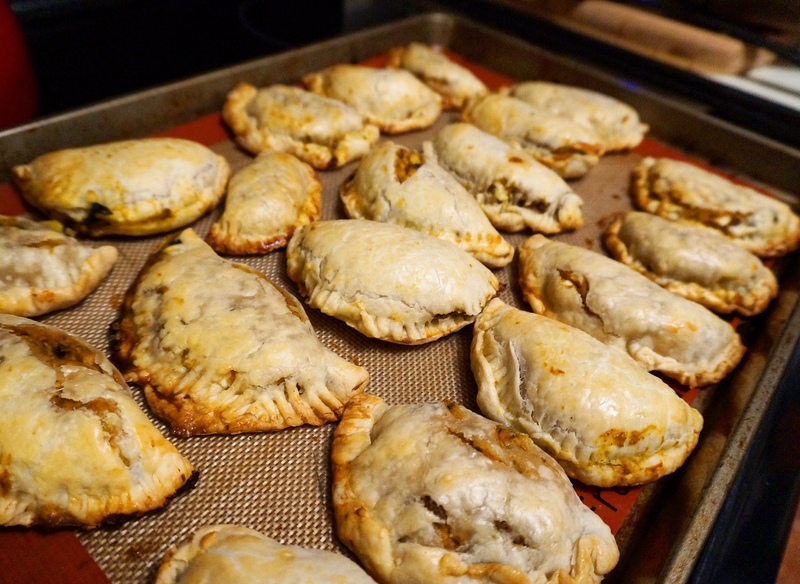 A little bit different, but still with those Thanksgiving flavors that everyone expects. I searched high and low on every Harris Teeter shelf to find empanada dough, to no avail. I guess Harris Teeter just doesn’t give off that Mexican vibe. I settled on Pillsbury pie crust- 2 for $4! I think it still turned out ok- the crust was flaky and crispy- I just had to punch out my own circles. NBD. For the filling, I used canned sweet potato, cream cheese, and a corn and black bean mixture that I sautéed with cilantro, onion and garlic. 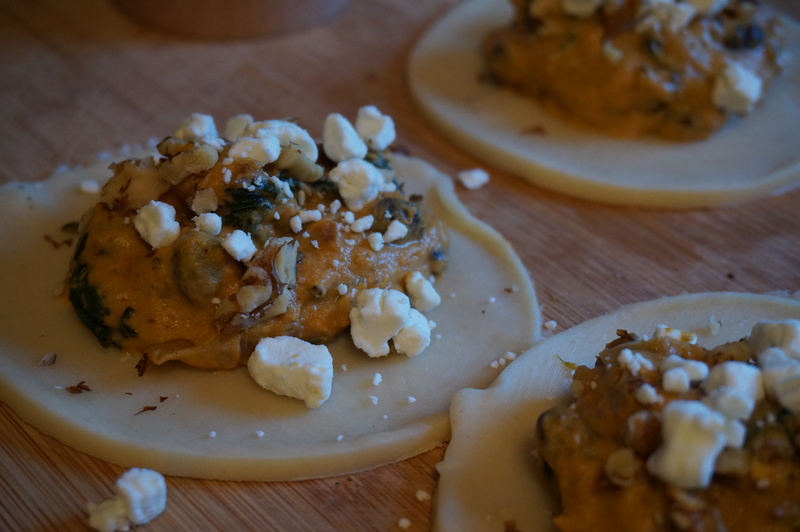 Crumbled goat cheese and walnut pieces on top! Then roll, crimp, and bake for about 20 minutes or until golden brown and flaky. A fun and different addition for Thanksgiving this year! 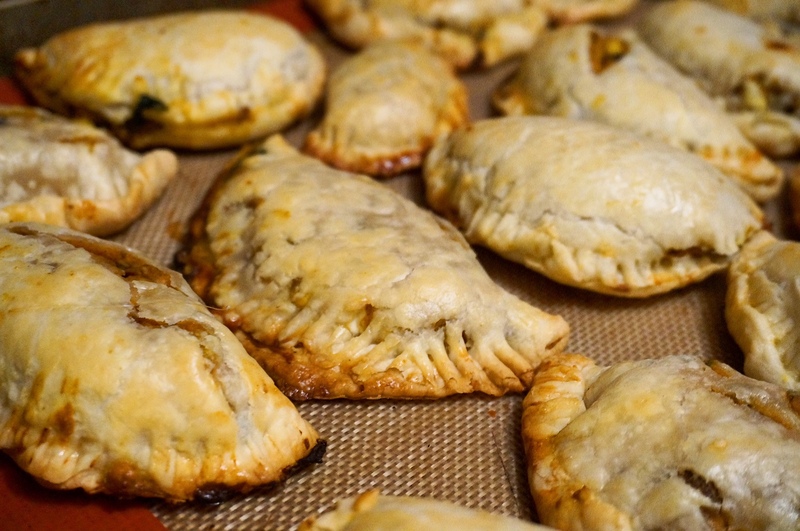 Use as an appetizer, side, or pair with a nice big salad for post-Turkey day leftovers! In a medium skillet, heat olive oil over medium-high. Add onion, garlic, and corn and cook, stirring occasionally, until onion is softened- about 4 minutes. 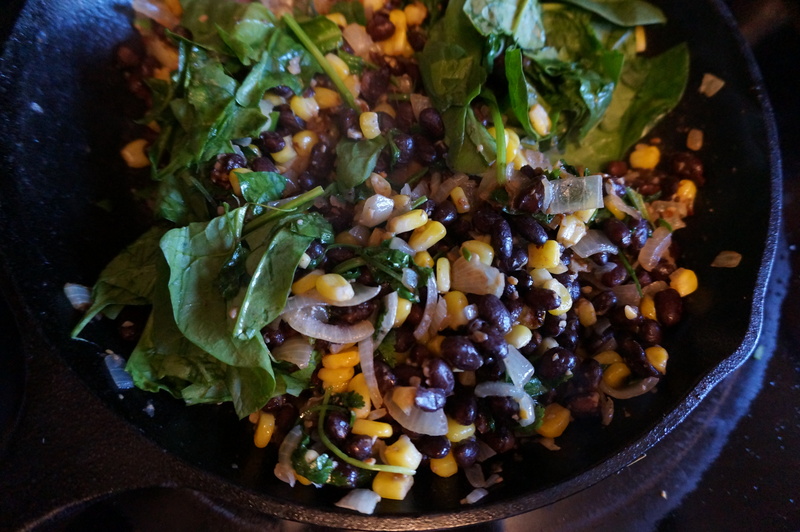 Add black beans, cilantro, and spinach and stir until wilted. Remove from heat and immediately stir in vinegar and lemon juice. Mash beans slightly with the back of your spoon. In a saucepan, heat butter over low heat. Add sweet potato, cream cheese, spices, and honey and stir to combine, until cheese is melted through. 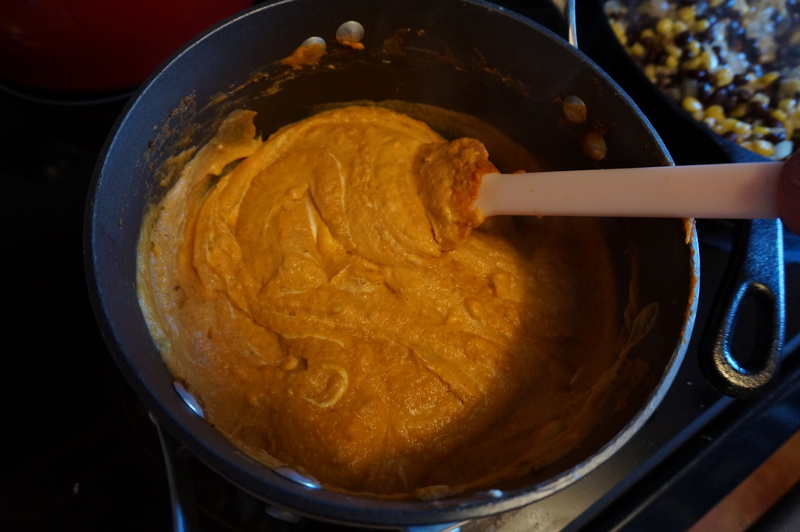 Add corn and bean mixture to sweet potatoes and mix. Unwrap pie crust and roll out with a rolling pin. Use the top of a large glass or a biscuit cutter to cut out circles 3″ in diameter. 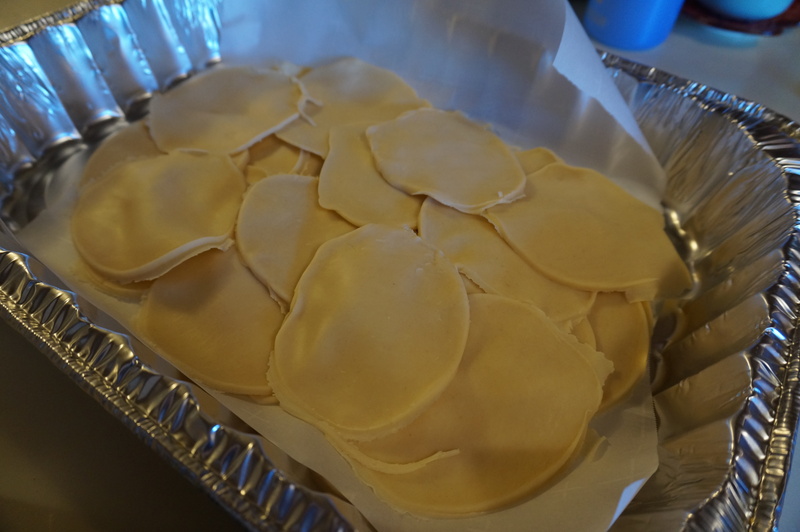 Fill each with about 1 tbsp filling, then fold over edges and crimp with fingers or a fork. Place on a cookie sheet and brush with egg wash (1 egg whisked with 1 tbsp water). Bake at 400 deg for 20 minutes, until golden brown and flaky. Heat sweet potato mixture with cream cheese and spices. Drizzle in honey. Cook onion with corn, beans, and cilantro. Cut out pie dough into circles about 3″ in diameter. Spoon about 1 tbsp filling onto each disc. Seal with fingers or a fork and brush with egg. Cook at 400 deg for 20 minutes or until golden brown.